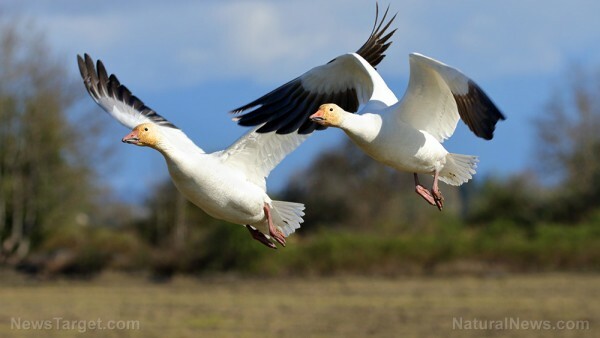 (Natural News) (NaturalNews) Thousands of snow geese were burned and poisoned to death when they landed in a Montana mine tailings lake filled with acid and toxic metals. The 700-acre Berkeley Pit is a massive crevice left behind from nearly 30 years of copper mining. It filled up with water 900 feet deep, which then accumulated toxic levels of inorganic compounds including arsenic, cadmium, cobalt, copper, iron and zinc. The water is as acidic as distilled vinegar, strong enough to liquefy the steel propeller of a motorboat. The pit is a Superfund site and also a tourist attraction, where people pay $2 to see the toxic, reddish water. It has also become renowned as a location to study extremophiles, microorganisms that can persist in conditions toxic to most life. The Pit is maintained by mining companies Montana Resources and Atlantic Richfield, which since 1995 have been responsible for preventing birds from landing in the toxic lake. In late November, an off-duty Montana Resources employee called to notify Berkeley Pit staff that a flock of about 25,000 snow geese was in the air about 25 miles away. The area typically only sees between 2,000 and 5,000 snow geese all year, including during the spring and winter migration periods. “The number of migrating geese that passed through this area and landed in the pit is unprecedented,” a Montana Resources spokesperson said. Mine employees used loud noises and drones to try and frighten the birds out of the water, but some remained in the lake even a week later. Since the incident, dead snow geese have been turning up near and across the nearby city of Butte, including on roadsides and in a Walmart parking lot. Officials expect the death toll to reach into the thousands. Because death from the water is not instantaneous, however, it may take a while to form a reliable estimate. Montana Resources and the Environmental Protection Agency (EPA) are using aircraft and drones to try to count the dead birds. This is not the first time a mass poisoning has taken place at the Berkeley Pit. In 1995, the dead bodies of 342 snow geese were found floating in the pit. The mine company initially denied that the water had poisoned the birds, instead saying they had eaten contaminated grain. But this was disproven by a University of Wyoming study showing burns and sores in the oral cavities, tracheas, esophagi and digestive organs of every bird autopsied. Heavy metals were also found in the animals’ kidneys. After that incident, the government ordered Montana Resources and Atlantic Richfield to operate a “hazing” program to scare geese away from the lake. The program seemingly brought the number of bird deaths down to about 15 per year – until now. Montana Resources has asked federal officials whether any further large migrations are expected. The large flock from the recent incident had bypassed its typical landing spot, Freezeout Lake, because it was completely frozen over. This occurred in part because the birds migrated later than usual due to warm weather in the Arctic, meaning that they arrived in Montana later into the winter. Then a snowstorm iced over Freezeout Lake. An investigation is underway to determine the causes of the incident. In addition to the delayed migration, one cause may be growing numbers of snow geese moving into new habitats. In the early 20th century, snow geese were endangered. A ban on hunting allowed their populations to rebound to 2 million by the 1980s. Now, the population is estimated at 15 million. The EPA is also investigating whether the mine operators were negligent in their duties.